More info:Price depends on cabin type chosen. This three week adventure takes you on the trail of Ernest Shackleton as you set sail as part of a small group on board one of the world's leading Polar expedition cruise ships, the MS Expedition, in the company of wildlife experts and knowledgeable history guides. 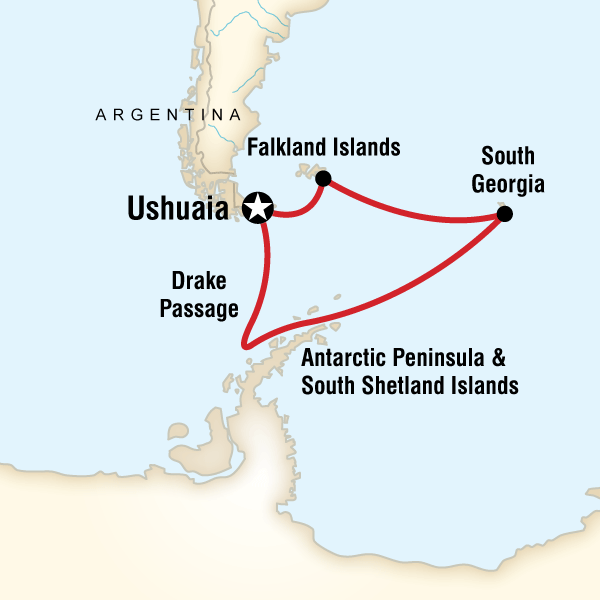 Uncovering more details about Shackleton’s epic adventures is just part of this incredible Antarctica vacation with chances to step foot on South Georgia and the Falklands offering insightful first-hand experiences relating to both the human history and the natural history of the region. From the Beagle Channel to Drake Passage this remarkable voyage allows passengers to become adventurers with penguins, seals, whales and albatross all playing no small part in what is all set to be a thrilling Antarctic expedition to keep and treasure for many more years to come. Staff & Crew - Our crew and expedition team act as stewards of the environment and are well versed in the strict environmental protocols on board and on land. All of our travellers are thoroughly briefed in these protocols before being allowed to participate in excursions and are always supervised by our team when on shore. Expedition Auctions - At the end of every M/S Expedition departure, we raffle our Captain’s Sea Chart together with expedition books signed by the staff, the flag from the bow of the ship and many other items as souvenirs of the voyage. All proceeds are then donated through Planeterra to support the BearHealth project and the Save the Albatross campaign. The Save the Albatross campaign was launched to prevent the slaughter of these magnificent birds. The program looks to oversee international fishing agreements, conservation of the species and research on trends in threatened populations of the Southern Ocean. Last year, our travellers donated over £15,000 to support the programme. Developed to address the health and wellbeing of polar bears due to the threats of global warming and pollution, the project aims to identify the effects of exposure to pollutants and climate change on the health of polar bears, and to compile the results in order to perform a total health assessment of polar bear populations in the Svalbard region. Marine Gas Fuel - The ship operates on marine gas oil which is cleaner than truck diesel fuel as it offers lower sulfur dioxide emissions. 4-Stroke Outboard Engines - In an effort to drastically reduce environmental pollutants 4-stroke outboard engines have been installed on all of our zodiacs. Our 4-stroke outboard motors produce less noise pollution and have engines similar to those of an automobile. Since there is no mixing of oil and gas the exhaust is intrinsically much cleaner and friendlier to the environment. Rechargeable Batteries - We provide battery chargers and rechargeable batteries on the ship for use by our travellers as a way to decrease the consumption of batteries and their harmful effects on the environment. Recycled non-chlorine bleached paper - In an attempt to reduce the amount of dioxins released into the environment through paper production, the ship has been stocked with recycled, non-chlorine bleached paper and toilet paper. Planeterra Foundation & the ship gift shop - Through our commitment to responsible tourism we have developed the Planeterra Foundation, a non-profit organization that supports local community projects and international charities around the world. Certain items sold in the ship’s gift shop have been made by local communities in South America. By purchasing these items you will be directly supporting these artisans and proceeds also go to the Planeterra Foundation’s community project fund.